The Fruit Company got their start in 1940 when owner Roy Webster wanted to start a company that grew the finest fruit available. Today the Fruit Company sends gift baskets, gourmet towers and treats to people around the country – and they have even been featured in Oprah magazine. A company focused on fine fruits and gift baskets. The Fruit Company focuses predominantly on fruit baskets, which is their specialty after all. They do, however, include chocolates, desserts, dried fruits, nuts and snacks, cheeses and other treats. They do not offer any non-edible options at this time or have varieties such as spa or movie gift baskets. 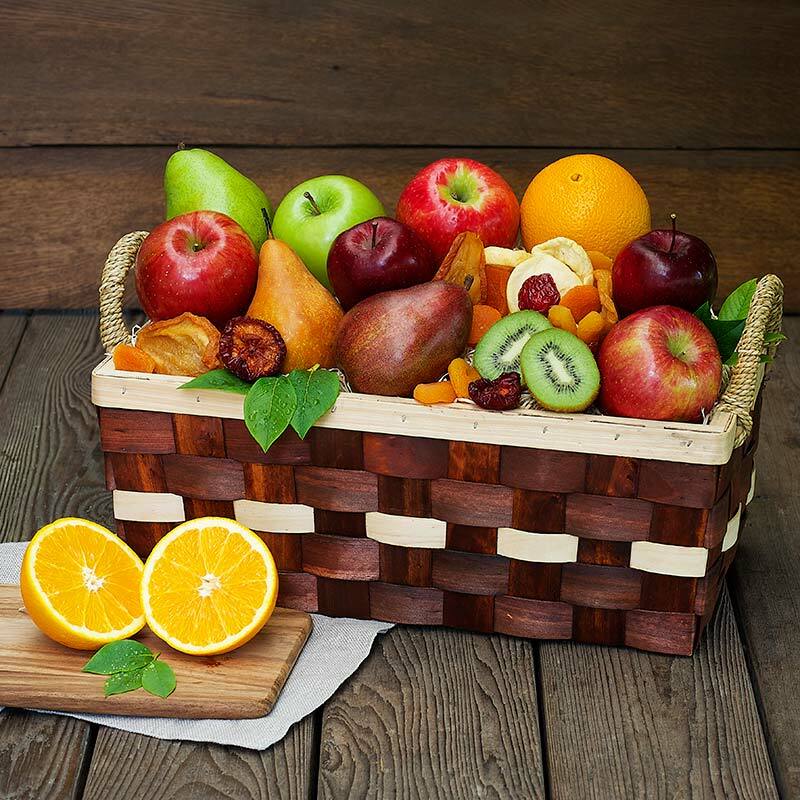 Instead all of their baskets are edible and can be combined or associated with fruits – if it doesn’t pair with fruit, they most likely won’t carry it. There is limited customization with The Fruit Company. If there is an item you need to specifically remove or swap out, you can call and order your basket over the 1-800 number. You cannot make substitutions online. Also, they do not have any add-ons or design-your-own options. Instead the baskets come premade. The Fruit Company does cover sentiments and occasions that you would expect, such as the major holidays, anniversary, birthday, “thank you”, sympathy, get well, new mom, graduation, congratulations, and a few others. They do offer gluten-free baskets, organic fruits, Kosher options and sugar-free options (minus the natural sugar found in fruit of course). While they don’t cover all of the sentiments, all of their baskets can be applied to specific occasions and they are one of the few to cover those specialty areas such as gluten-free and sugar-free. 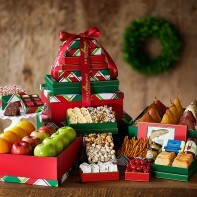 The Fruit Company does offer corporate gifts and they have their own menu option for corporate gift ideas. But, they do not have bulk ordering, discounts or any specific perks for corporate buyers – something we hope they improve on soon. On average, The Fruit Company offers baskets from $30 to $150. They do have a good number of baskets under $50, but their baskets will cost more than the competition simply because of the produce and organic options they offer. Even baskets under $50 are still over 12 inches long and full of items. The Fruit Company does offer standard shipping rates. They are based on the gift’s retail price. For gifts under $60, you can expect to pay $6 to $39 for shipping – depending on how quick you want it. For gifts priced over $60.01, you will pay anywhere from $9 to $44 for shipping. Lower price points are for standard shipping. They do not offer same-day delivery or shipping, which we hope they add in the future. Due to fruit varieties and seasons, some fruits may take longer to ship too. There are some random baskets that offer free shipping or free overnight delivery – such as sympathy gift baskets. If you are looking for a basket with free shipping you can select the menu option and select from those baskets offered at the time. When ordered as a gift, personalized messages can be included. Some gifts you can swap out the color of the ribbon (for extra) to make it more gift-centric too. They do post pictures of the products with other products not included, which can be misleading unless a customer truly reads the fine print. We found a few baskets pictured with wine, but the wine wasn’t actually part of the basket. While we appreciate their effort to show the products more “in use,” some customers may be disappointed when they realize they are not buying what they saw in the picture. The return policy with The Fruit Company isn’t as impressive as other companies. They do offer a satisfaction guarantee, so if you receive a product that is not up to par, they will replace it – no need to return it. All of their gifts, however, are considered “perishable” and therefore cannot be returned simply because you do not like it. The only way you can receive a replacement is if it is damaged or not in the condition promised. They do not offer any refunds for late baskets; instead, it is up to the buyer to pay attention to shipping and policies and then accommodate delays by paying for expedited options. The Fruit Company could use some beefing up on their FAQs section. It is rather limited on information and they could use a little more in there for prospective customers with questions. After all, these days customers don’t want to call in just to have a few questions answered. When it comes to contact, they are available only Monday – Friday from 7am to 5pm PST via their toll-free number or email contact form. There is no live chat. The Fruit Company carries an A rating with the BBB, but they are not accredited. Unfortunately this is sort of a drawback, especially with so much of their competitors already accredited and highly ranked. Under $50 – The baskets under $50 are more like boxes with just a small handful of fruits or chocolate-covered fruit varieties. They do have a few towers that include nuts and fruits under $50 as well. $50 to $100 – A large majority of baskets are in this price range and will include fruits, snacks, gourmet cheeses and chocolates. They are fairly hearty, especially when it comes to fruits. $100 to $200 – These baskets have the biggest selection, including fruits, snacks, jams, cheeses and even crackers. There are more baskets in this price range as well. $200 and up – They do not have a lot of baskets over $200 and those that are come packed full of fruits, cheeses, jarred products (such as jam or spreads), crackers, cookies, chocolates and more. The baskets from The Fruit Company are more ideal for those looking for fruit baskets rather than gourmet snacks or even wine gifts. Because the large majority of baskets are revolved around fruit, they may not work for gift givers that want something more shelf-stable. That being said, their prices are competitive and they even have some budget-friendly options for the buyer that doesn’t want to spend a fortune, but still wants to give their recipient something good. We do like The Fruit Company’s dedication to their brand and high-quality fruits. Every basket includes their signature organic varieties of fruit and they are highlighted within each basket – making other products more of an accent. There are some baskets that ship for free or have free overnight delivery, which is always good for those doing last minute shopping or ordering an unexpected gift (such as a sympathy gift). There are a few things we hope they offer in the future, such as wines – which pair great with fruit. Also, we feel that some of their baskets are heartily overpriced considering the majority of the products in the basket are just fruit. We don’t like that some of their pictures are more robust or show products that aren’t even in the basket – this can be misleading. Their return policy could use some improvement, especially if they are going to show pictures of items they don’t include. Because if someone orders a basket and is unsatisfied, they cannot receive a refund. A company that is devoted to fine tuning the art of sending the perfect fruit. The Fruit Company is a great place to shop for gourmet fruit baskets - including dried fruits and chocolate-covered fruits. They do have fast shipping and free shipping on some products, making them ideal for those that want gourmet baskets without spending an arm and a leg on shipping. Under $50 - The baskets under $50 are more like boxes with just a small handful of fruits or chocolate-covered fruit varieties. They do have a few towers that include nuts and fruits under $50 as well. $50 to $100 - A large majority of baskets are in this price range and will include fruits, snacks, gourmet cheeses and chocolates. They are fairly hearty, especially when it comes to fruits. $100 to $200 - These baskets have the biggest selection, including fruits, snacks, jams, cheeses and even crackers. There are more baskets in this price range as well. $200 and up - They do not have a lot of baskets over $200 and those that are come packed full of fruits, cheeses, jarred products (such as jam or spreads), crackers, cookies, chocolates and more.